This is a project to use up some of those small pieces of paper you just don't know what to do with. I make refractive watercolor painted back grounds for some of my work. I splatter, float and drip paint on larger than I need watercolor paper. After it dries I cut it to the size I need from the best parts of the paper. I salvage as much of the trimmings as I can. Anything over an inch in size is saved for other smaller projects. I've got a bunch of "Inchie" sized paper. I'm not into making or collecting inches. I decided to glue them together so I would have a larger space to work in. You will make one for one partner. Your back ground will have color, Use black or other dark permanent on your paper bits for making the tangles. 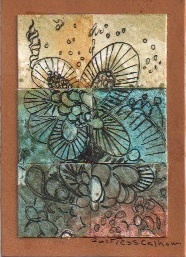 It should turn out as a sturdy zentangled ATC. The usual Swap-bot rules apply. Flaking will not be tolerated. If you have a problem let your partner know. If your flaked on let me know. Questions and suggestions IM me. Question please? If we glue 6- 1" squares together, it won't be the normal ATC size. It'll be 3" X 3". Is that the size it's suppose to be? The way to make this fit on a standard ATC is 2 squares across and 3 down. It leaves a small margin around the squares that give it a framed look it you use a contrasting color card stock to mount the squares on. Look closely at the example above, it shows how I placed the squares on the ATC. I've done mine. It was really fun. I hope you'll do another swap like this in the future. how about a 3.5 inch square? It uses 9 inchie tiles, 3 across and 3 down. Like the ATC the left over space makes a nice frame. There is now a second Zentangled Inchies Mosaic swap up. Its for a 3.5 inch tile other than that its the same as this one.